What an engaging idea - Engagement Cupcakes. Forget Engagement Cakes as Engagement Cupcakes have become the treat of choice at chic parties everywhere. Bakers everywhere are receiving requests for beautifully decorated cupcakes at occasions including bridal showers, engagement parties, weddings, anniversaries, and more. There is something that is so beautiful about a plate of artfully arranged little engagement cakes at your party that will have guests ooohing and aaahing at more than just your new ring! The best part is that even a novice baker can create fanciful engagement cupcakes at home that will add a little bit of fun and whimsy to your engagement celebration. Experiment with flavors and fillings to find a tasty engagement cakes that everyone will love. Your cupcakes can be as casual or formal as you would like, and you will feel like a master pastry chef in no time! Cupcake wrappers come in dozens of designs that are perfect for an engagement party. The best part is, this is the simplest way to make a big impression without a lot of tricky decorating. Simply make your favorite cupcake, then frost. Try a chocolate ganache frosting with a sprinkling of decorative sugar crystals to give it that "bling" feeling. Then, place each cupcake in the wrapper of your choice, and you've got a bakery style treat faster than you can say "I do"! White fluffy frosting swirled onto cupcakes with a star-tipped nozzle and topped with red edible hearts or glitter look perfect for an engagement. A red cupcake wrapper completes the theme of love and romance. Once you have selected your colors, bake cupcakes in your favorite flavor. Then, simply frost the top with cream cheese frosting using a wide piped frosting tip starting from the edge and moving inward. The finished product should look like a rose. Then, add pre-made sugar leaves (1 per cupcake) to the edge of the cupcake. A tiered cake plate full of these sweet treats will be as beautiful as a bridal bouquet. If you are not confident piping frosting, the easy alternative is to frost the engagment cupcakes and use a sugar flower as the topper. 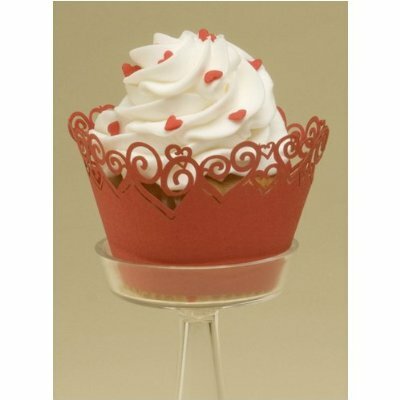 Sugar decorations are available at specialty cake supply stores and are in the baking aisles of most supermarkets. Fondant is one of the most versatile decorating options you can use. For a more casual party, try making cupcakes that look like bride and groom faces using fondant and piped icing. For the bride, use a flesh colored circle to cover the top of the cupcake, and then make a veil to cover the face from white fondant. Use piping to add details like a face, hair, or a string of pearls. For the groom, place the flesh colored circle on top of the engagement cakes, then make hair from fondant and decorate with icing details like a face and a bowtie. Be creative, they don't have to be perfect! There is nothing more beautiful than a simple cupcake with white icing. Make a batch, then use piped icing in your wedding colors to decorate the tops with your initials (i.e. LB + JS), the date of the wedding, "I do", or other wedding related phrases. You should practice writing with icing before you start for the best results. Begin this project by making your own tiered cake stand. Find empty boxes in varying sizes that will stack neatly on top of each other. Cover each box with a pretty wrapping paper or cloth, then stack and secure with tape. Wrap a coordinating ribbon around each box and tie with a fluffy bow. 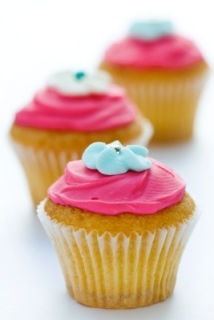 Make sure that the width of each tier is enough for a cupcake to rest on. 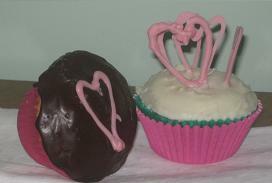 Then, bake cupcakes and cover with a pink-tinted glace frosting, and top with a cherry. Purchase (non-edible) wedding bands from your local craft store, and place them around the stem of the cherry. Place the cupcakes along the tiers, and you will have a beautiful "cake" for your party! Bake a batch of cupcakes and frost with a fluffy white frosting. Then, use royal icing, or chocolate, to make heart shapes on a piece of wax paper. Let the shapes dry thoroughly, and then gently remove them from the wax paper. Stand two hearts upright in the frosting and you've got a quick but adorable cupcake. No matter which way you decide to decorate your engagement cakes, they are sure to be a big hit at your party. Let your imagination run wild to find a design that represents the two of you. The type of decorating you do will depend upon the type of gathering you are having. A formal party would probably call for a tiered cupcake tower, whereas for a stand-up function platters of engagement cakes that can be easily handed around would be more suitable. Do you have a color theme? Are you using any other theme that your cupcake topper can be tied in with? You can be as imaginative as you like when decorating your engagement cupcakes.